Not so long ago, beer selection was pretty simple and straightforward. Most people had a “brand” of beer they always drank and the local pub had a standard set of brews on tap that remained constant. These days, however, try going into a local bar or even a local grocery store and counting fewer than 10 different styles of beer, many of which you have probably never heard of, and I will buy you a beer of your choice. We are now in the age of craft beer and it is a beautiful time for beer lovers. Not only do craft beers taste delicious and have some surprising health benefits , but they also have an enormous positive impact on the economy. 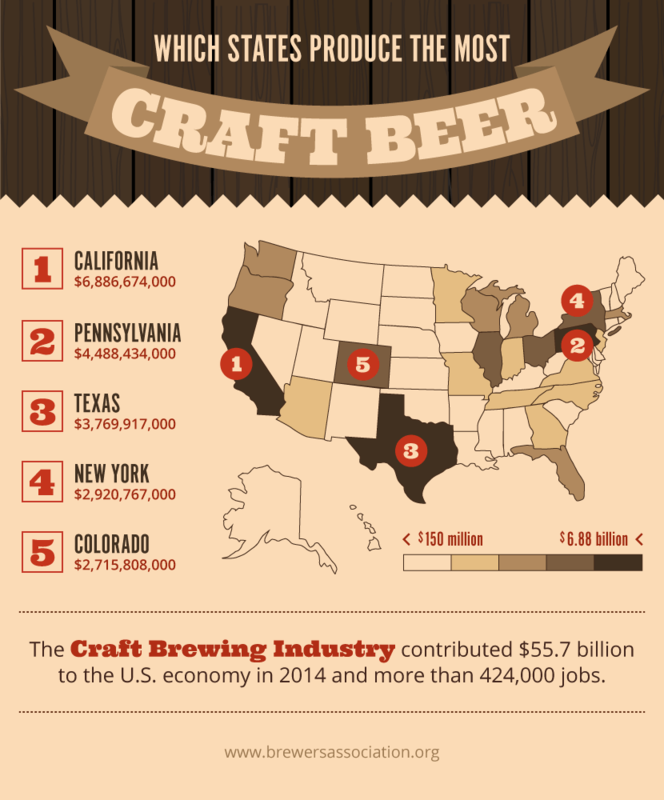 The craft brewing industry in the U.S. alone ballooned into a $55.7 billion industry as of 2014 and created more than 424,000 jobs. To classify a brewer as a craft brewer, the Brewers Association’s definition requires the brewer to be independently owned and generate less than six million barrels of beer a year. Using this definition, craft breweries now account for 99 percent of America’s 3,000-plus breweries. The states with the largest number of breweries and greatest economic impact are California, Pennsylvania, Texas, New York, and Colorado, with each state generating billions in revenue. That’s quite a feat during the rough times that many other industries face. Sure, the out-of-pocket cost for craft beer is higher than your average mass-produced beer, but you can feel good about your purchase, as it is supporting small business and job growth. Another reason the cost of craft beer is higher than mass-produced beer is that each brewery creates its own flavor/style/twist on the brewing process. And it’s not easy, either. Brewing is all about science and getting the right blend and balance of key essential ingredients while maintaining the right temperature. And let’s not forget about passion. If you can find a craft brewer (or home brewer) who is not passionate about the beer, I will buy you another beer of your choice. Beer has four main components regardless of style: malt, hops, yeast, and water. The female flowers of the hop plant, Humulus lupulus, are the “spices” of craft beer. There are hundreds of varieties and brewers choose different hops to create a specific zing to the beer, ranging from floral, citrusy, or fruity to earthy or piney. The bitterness in hops helps to balance the sweetness of the malt. Biologically classified as fungi, yeast are single-celled organisms that feed on sugars, which are then converted to alcohol with byproducts including carbon dioxide; this is the fermentation process. 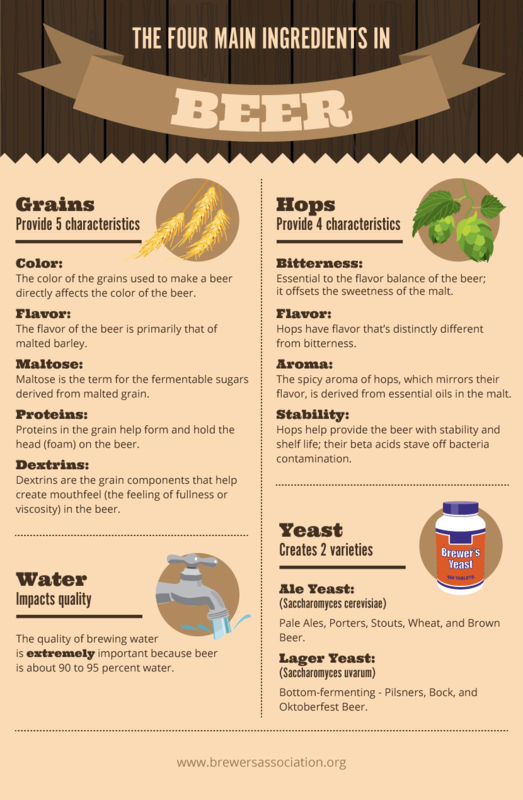 There are hundreds of strains, but for brewing, yeast are classified into top fermenting yeasts (for ales) and bottom fermenting yeasts (for lagers), which determine the style of beer created. Without yeast, there is no alcohol, so we love those little buggers! Since beer is mostly water (about 95 percent), some would argue that the quality of the water is the most important attribute. Water contains various minerals and ions that contribute to the overall flavor of the beer. Depending on the region where the water is produced, the beer can contain calcium, magnesium, sulfate, and bicarbonate. Many brewers modify the mineral content in water depending on the result they wish to achieve. Who said beer isn’t healthy? 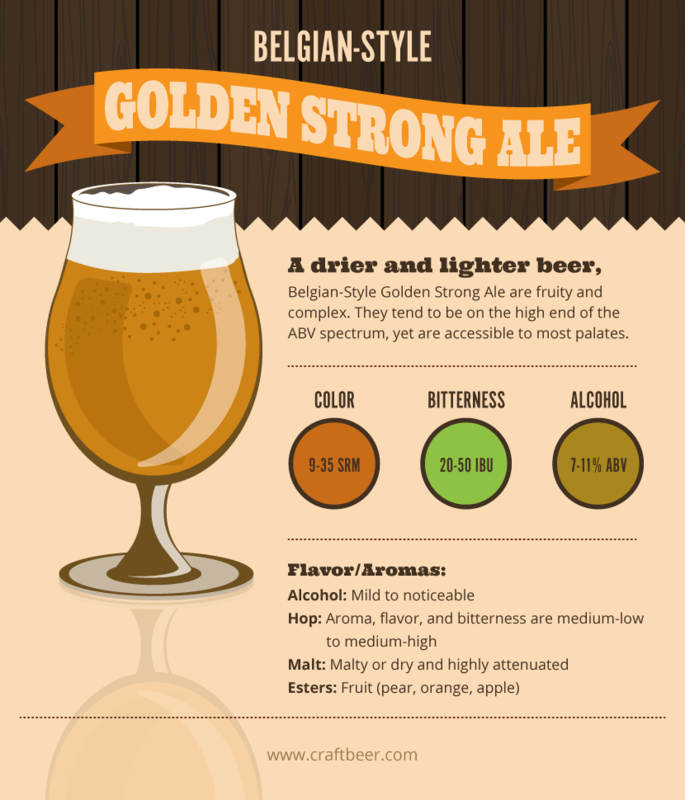 In addition to the four main ingredients, many craft brewers are adding various fruits, spices, honey, molasses, and other flavor enhancers to make their beer unique. But keep in mind the four main ingredients discussed here are in all beer, so the individual tastes are even more fascinating with the knowledge that the slightest change can create a whole new flavor. That’s what makes brewing exciting! Let’s go back to the local pub or grocery store and examine the plethora of choices available to beer lovers: how in the world do you pick between ales, lagers, stouts, and IPAs, and what does it all mean? Vital statistics – original gravity (OG); final gravity (FG); alcohol by volume (ABV); international bitterness units (IBUs); and Standard Reference Method (SRM) Let’s look at five different styles to see how this categorization differs per the BJCP. Aroma: Low to no malt aromas, can be perceived as sweet or corn-like. Hop aroma ranges from none to light, spicy, or floral. Appearance: Very pale straw to medium yellow color. Little frothy head. Very clear. Flavor: Crisp and dry finish. Hop bitterness is low to medium-low level. High levels of carbonation accentuate dry finish. Mouthfeel: Low to medium-low body. Very highly carbonated. History: Modern American lager style was heavily influenced by Prohibition and World War II. Surviving breweries consolidated and created a broadly appealing beer. Ingredients: Two- or six-row barley with high percentage (up to 40 percent) of rice or corn as adjuncts. 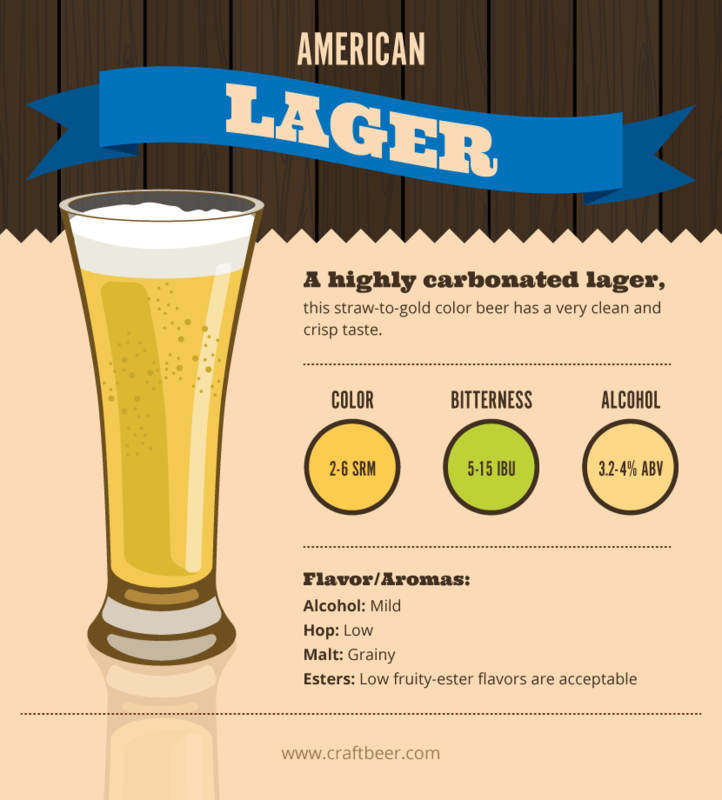 Examples of American Lager: Pabst Blue Ribbon, Miller High Life, Pacifico. 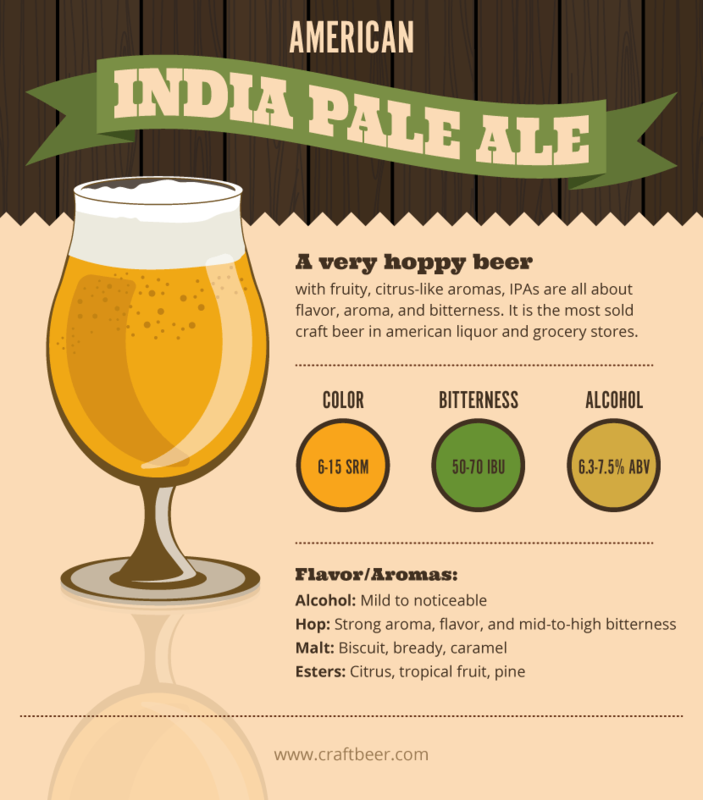 Aroma: prominent/intense hop aroma with citrus, floral, pine, resinous, spicy, stone fruit, etc. Many versions are dry hopped and can have fresh hop aroma. A low to medium-low clean, grainy-malty aroma may be found in the background. Many various hops used, constantly changing the aromas of American IPAs. Appearance: medium gold to light reddish-amber. Should be clear but can be hazy if unfiltered. Medium-sized, white to off-white head with good persistence. Flavor: Hop flavor and bitterness is medium to very high. 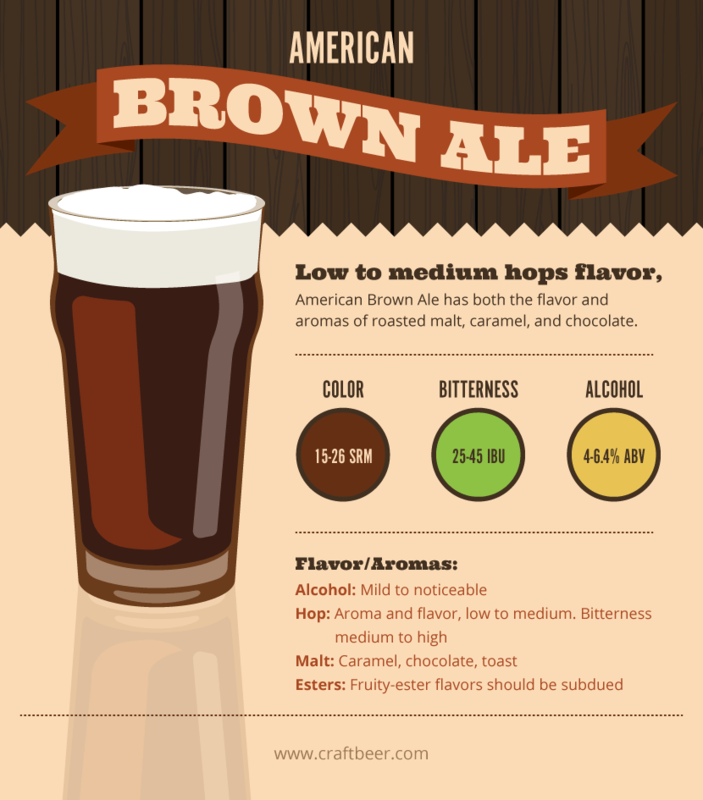 Malt flavor is low to medium-low and is generally clean and grainy-malty. Some may have caramel or toasty flavor. Hops dominate. Dry finish. Mouthfeel: medium-light to medium body, with smooth texture. Medium to medium-high carbonation. Very light, smooth alcohol warming. History: American IPA is an interpretation of the English IPA, brewed using American ingredients and attitude. First American IPA was Anchor Liberty Ale in 1975 using whole Cascade hops. Ingredients: Pale ale or two-row brewers malt as base, American or New World hops; American or English yeast with clean or slightly fruity profile. Malt mashed at lower temperatures for high attenuation. Some brewers add sugar. Aroma: Moderate malty-sweet to malty-rich aroma with chocolate, caramel, nutty, and/or toasty qualities. Dark malt character is more robust than other brown ales. Appearance: Deep copper to very dark brown. Flavor: Roasted malt, caramel-like, and chocolate-like characters should be of medium intensity. Mouthfeel: medium to medium-full body and carbonation. History: American style from the modern craft beer era inspired by English brown ales but with more hops. Pete’s Wicked Ale was a pioneer. Ingredients: Well-modified pale malt plus American hops. Examples of American brown ale: Smuttynose Old Brown Dog, Telluride Face Down Brown. Aroma: Complex with fruity esters, moderate spiciness. Low to moderate alcohol and hops aroma. Malt is light and slightly grainy-sweet. Appearance: Yellow to medium gold color. Good clarity. Long-lasting, often beady, white frothy head. Flavor: Fruity, spicy and alcohol with soft malt. Bitterness is medium to high. Mouthfeel: very carbonated. Light to medium body. Smooth with noticeable alcohol warmth. History: Originally developed by Moortgat brewery after WWII. Ingredients: Pilsner malt; Saazer-type hops or Syrian Goldings are common. Belgian yeast. Examples of Belgian Golden Strong Ale: Delirium Tremens, Duvel, Piraat, Brigand. It is important to remember that each person has personal tastes. Much like food, what I consider delicious may be repulsive to you. Ask your brewer or barkeep for a taste of the beer before you order a whole pint and discover it does not suit your personal taste. Better yet, do some research into home brewing and experiment with different brewing styles on your own. Beer has been around for generations and this new era is one of the most exciting. Now, go out and have fun trying out new styles and pairing them with different foods. Find local craft breweries in your area on soilmate.com! interested about craft beer? lear how to start your own cellar at home here. Megan is a healthcare professional in New York City by day, but her passions lie in writing, constantly learning, her family and fur babies, the outdoors, and spiritual philosophy. Her hobbies include craft beer, going to music festivals, and cooking. These activities help to balance the hustle of a NYC professional and bring her the most joy. A Texas Native who has lived in New England and now New York; blending the Texas way of life with the East Coast mentality is her favorite challenge.